January 19, 1996. A perfect ski day in Utah. Paul Zane Pilzer was on a lift, just reaching the top of the slope, when his cell phone rang. “Paul? This is Mike Herblet from Amway,” said the voice. Pilzer jumped off the lift, sat himself down in the snow, and unhooked his skis. He had spent five years working on Amway; any call from the home-products giant could be critical. Forty-five minutes later, Pilzer stood and took one of the greatest runs of his life. He had clinched an unprecedented deal to sell his educational CD-ROMs through Amway, among the biggest network marketing companies in the world. By itself, this arrangement does not make Pilzer the king of the CD-ROM Mountain, but it sure does lift him above the crowd. The CD-ROM market is incredibly competitive, with about 8,500 companies scrambling for a foothold. Widespread distribution is a powerful competitive advantage. Amway is a $6.8 billion giant with a vast system of distributors selling all over the world. Its one-on-one sales approach is made to order for a fresh product that is still unfamiliar to most potential customers. The “marriage made in heaven” followed a long courtship. In 1991 Don Held, one of Amway Corp.’s top independent distributors, booked Pilzer to speak in St. Louis at a meeting of 3,500 distributors. Pilzer had never heard of Amway or network marketing. Pilzer’s speech was based on his 1990 book Unlimited Wealth, which debunks the belief that the world’s wealth is limited and the next guy’s piece of the pie limits yours. Instead, he said, wealth is created anew through entrepreneurship and can best be generated through distribution, rather than manufacturing. His message spoke to the heart of network marketing, which is essentially a method of distributing goods and services. Pilzer’s speech had the audience standing on chairs and cheering. Amway distributors bought millions of cassettes of the speech. A few months later, at his pentagonal glass house on a Utah mountaintop, Pilzer hosted a dinner for three major players from the Amway organization: then-COO Tom Eggleston and Dexter and Birdie Yager, who head a downline estimated at a million distributors–about half the global total. Pilzer spoke about the educational CD-ROMs he had been publishing for two years. With his guests huddled around the computer, he brought a Bible software program onto the screen and typed in the word “David.” Immediately, every biblical reference to the name appeared. The Amway group was blown away. When he was 21 and in the MBA program at Wharton Business School, Pilzer (now 43) designed a computer program that let macroeconomics students give themselves self-quizzes and provided answers that corrected wrong assumptions. “One day this technology will allow us to affordably bring the best teacher of every subject to every student,” his thesis prophesied. Pilzer realized that interaction between students and teachers was the key to learning. He knew this interactivity could be replicated on a computer, but at the time the only interactive software was being developed for the now $15 billion international video-game industry. Seeing his friends’ children engrossed in Nintendo, he realized the appeal of a computer game: It had unlimited patience and offered its undivided attention. Why couldn’t the same technology be used to get kids engrossed in algebra? He tested his theories in 1989. Sony executives invited him to be one of the creators of software for the Sony MMCD Player, a handheld, DOS-based device designed to play CD-ROMs. The disk he produced featured motivational author Anthony Robbins, who interviewed Pilzer about his economic views. At various spots viewers could point and click to see printed works by both men. The disk, Pilzer says, was the country’s seventh-best-selling CD-ROM in 1992. He soon developed the PowerCD Operating Environment, an interactive model that became the foundation of his Dallas-based company, then called Zane Publishing Inc. The PowerCD runs in any platform–DOS, Windows, Mac. Pilzer tried to license the PowerCD to such large educational publishers as Simon & Schuster, Macmillan, and Prentice Hall. Maybe they could produce their textbooks as CD-ROMs. When none agreed, he asked them to give Zane the right to put their textbooks on CD-ROMs and sell them in nonschool markets. As a result, he says, his company owns the electronic rights to “probably the largest collection of curriculum-based intellectual property in the world”–many of the major textbooks used by American students, as well as the Merriam-Webster dictionaries. But Pilzer’s CD-ROMs are based on, and used with, popular textbooks by established teachers and can be easily integrated into a curriculum. They are highly specific: There are disks on Shakespeare’s Globe Theatre, on surrealistic art, on plant anatomy. Each has quizzes–a new one can be clicked on every 15 seconds–usable by a student at home or a teacher in a classroom. When Pilzer started Zane in 1989, he assumed that Blockbuster Video stores would bring CD-ROMs into every neighborhood. But Blockbuster decided against stocking them after three unsuccessful 50-store trials in California. The sale of Zane’s CD-ROMs in computer stores and other retail outlets has met only limited success. As late as 1996, Zane had 0.1 percent of the $3 billion CD-ROM retail market, ranking 106th among 655 companies, according to SoftTrends, a software tracking service in Port Washington, N.Y. Which is why Amway began looming larger and larger in Pilzer’s strategy. Amway has 2.5 million distributors who sell its household products, as well as products and services from other companies–from travel packages to breakfast cereals. His biggest hurdle with Amway was not having enough different disks to offer customers. For four years Zane worked to create programs. But 1994 it had 120. Amway wanted more. Besides the executives, Pilzer had to win over a board of top distributors. The courtship began with dinner at his house in 1991. That night he asked for and wrote down the names of the Yagers’ and Eggleston’s children and grandchildren. He did the same with the families of other Amway “diamond” distributors and executives. Whenever he released a new CD-ROM, he sent it to those children, sometimes starting an e-mail correspondence. Pilzer also lectured to Amway distributors about twice a month. He estimates that he spoke to more than a million between 1991 and 1996. After finishing a speech at noon, he says, he’d sometimes sign books until 3 A.M. If distributors liked his CD-ROMs, he’d encourage them to tell Amway’s corporate side. As Pilzer tells it, Grillos called a top executive he knew at Apple and said, “I’m sitting in the office of Paul Pilzer, chairman of Zane Publishing. He has a $250,000 check from you, and he wants to apologize. He wants to return it… What’s the deal? He’s got the best education software in the world, but it’s not done yet and won’t be done for a year, so you’re going to buy $1.25 million of it right now and make this $250,000 a deposit.” The deal would mean that Apple’s books would not show a quarter-million loss because of a mistake, and Zane’s books would show hefty advance orders from an industry heavyweight. Grillos invested in Zane, joined the board, and attracted other Silicon Valley investors. Pilzer estimates venture capitalists have put in about $6 million. Zane expanded its CD-ROM offerings steadily. Then, in August 1995, Amway COO Eggleston suddenly left the company and the founders’ two sons assumed leadership. 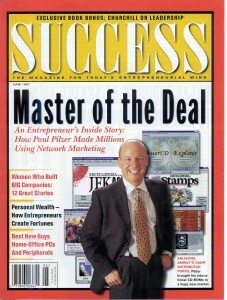 Suddenly, Pilzer says, “I was not on the radar screen.” Five months later later he had resigned himself to working out deals with other network marketing companies–and then came that surprise call on the ski slope. To this day, he says, he has no idea what went on inside Amway that led to the turnaround. We reviewed Paul’s CD-ROM educational program and decided it would be a good fit for our distributors and customers,” says Bill Gerst, Amway’s merchandise manager. “Many have school-age children.” On March 28, 1996, Amway agreed to carry the CD-ROMs, securing the right to keep selling them if he goes out of business. The product was launched the following July with a catalog that included 180 CD-ROMs covering half the curriculum of grades K through 12, including 24 in biology, 42 in history, and 34 in literature. Each CD-ROM sold for $15. A “family pack” of 132 was priced at $1,000. It became the surprise top seller. Amway also connected Pilzer with other CD-ROM publishers, including Logos Research Systems, a major religious publisher, and Kaplan Educational Centers, which publishes preparatory material for standardized assessment tests. Today Zane manufactures those companies’ CD-ROMs and distributes them through Amway, paying the companies a royalty on sales. Another potential “windfall,” in Pilzer’s words, arose when major textbook publishers noticed a new trend. Increasingly, school administrators are allowing teachers to select computer software, rather than buying a bundle of programs for the whole district. A typical school publisher’s sales force of fewer than 500 is hard pressed to reach the country’s 2.75 million teachers. A number of companies, including Simon & Schuster and Prentice Hall, decided to allow Amway distributors to sell Zane CD-ROMs directly to teachers and schools. But it is undeniably a growing market. To help distributors reach it, Zane put out a school catalog in January. Amway distributors pitch teachers on how the CD-ROMs can save time. With a few points and clicks, a teacher can print instant quizzes. In nine months of selling, Amway distributors accounted for a third of Zane’s sales. So far, 100,000 Amway distributors in the United States have bought the CD-ROMs, he estimates, and of those, 30,000 are actively selling them. Pilzer says Zane’s sales have increased from about $300,000 in 1994 to $6.5 million in 1996. He estimates that more than 10 million CD-ROMs have been sold to date. In January Zane was acquired by Zane Interactive Publishing Inc., a public company that had raised capital for an Internet product that never materialized. A secondary offering planned for the third quarter of 1997 is designed to raise $10 million to build distribution channels, says Pilzer, who now receives a $12,000 monthly salary and owns 19 percent of the company. He recently left his CEO position to act as publisher and chairman, which gives him more contact with children and teachers. “I spend half my week listening to them–reading their letters, calling them up,” he says. “I’m the one who has to ensure that the product works in educating children before it gets into the marketplace.” Last year he became an Amway distributor in the Yagers’ and Don Held’s downline. “Many people I meet want to get titles, and the least expensive way is through Amway,” he says. High-ranking Amway distributors like Kathy and Jody Victor (left) Susan and Hal Gooch (with Pilzer) and the Broomes (below) have helped promote the CD-ROMs, Pilzer says. Steve Van Andel, current chairman of Amway Corp., with Pilzer (right). Distributors Diana and Clarke Broome. Paul Pilzer spoke about his CD-ROMs at a meeting organized by Hal Gooch in Atlanta in January. Pilzer estimates that 34,000 people attended.